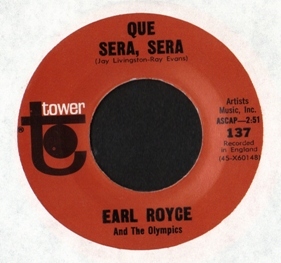 Today's specimen is a 45 by a Liverpool band called Earl Royce and The Olympics on the Capitol records subsidiary Tower (home to loads of off the wall U.K. acts like The Toggery Five, The Beat Merchants, the pre-Wimple Winch act The Four Just Men and even the first two Pink Floyd 45's among MANY English others.....). This was an American issue of their debut British single (originally released on Columbia DB 7433 in December 1964). The band only released two 45's in the U.K. and appeared in a "Battle of the bands" scene in the Gerry and The Pacemakers celluloid "Ferry Cross The Mersey" doing a tepid version of "Shake A Tail Feather" . Doris Day's signature tune, "Que Sera Sera" was featured in the live repertoire's of many beat groups. 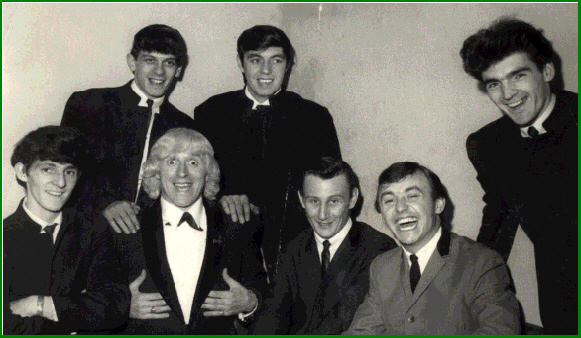 However the inspiration was more likely from the r&b group The High Keys 1963 interpretation. This version differs quite a bit from that only borrowing bits of their backing vocal technique and losing their Latin flavor turning it, instead, into a true "beat ballad". Earl Royce's (presumably the band's lead singer I'm guessing) hic-cuppy vocal style on their version is quite spirited with the guitar bits mimicking the style on Mickie and Sylvia's "Love Is Strange". "I Really Do" has a country and western feel with some Carl Perkin's inspired lead guitar, not really my thing but at least it's different fare from a beat group. Both sides were produced by George Martin (who produced both of their singles). All of the band's material was collected as bonus tracks on the CD reissue of the "Ferry Cross the Mersey" soundtrack on EMI (which is also available for download from iTunes). Cool Foreign E.P. 's Part 37: Los Salvajes!